There are many ways to go about constructing a custom keyboard. 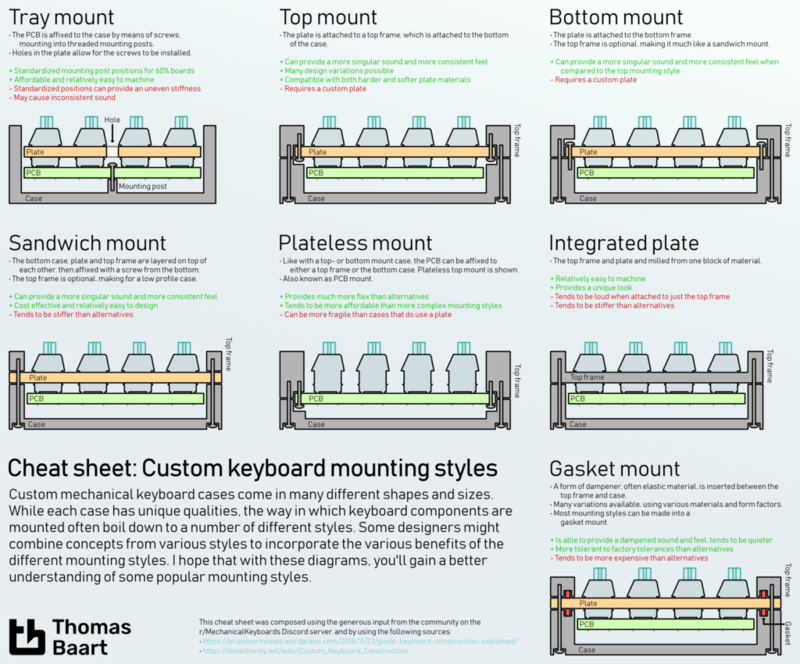 Getting an overview of the options available can be difficult, so I set out to create a cheat sheet showing some of the popular keyboard mounting styles. Brian Lee wrote an excellent article on keyboard construction in November 2018. While his article goes into keyboard construction as a whole, covering multiple aspects such as material properties, sound and the various way to assemble a keyboard, I missed an overview showing the options out there in a visual way. I made a cheat cheat showing various mounting options, along with a few often observed pros and cons. The keyboards you’ll see out in the wild may use one or more styles combined to gain access to the benefits (and limitations) of those styles. I hope you’ll find it useful as a starting point to learn more about what’s possible! Click on this image to open it full sized in a new tab.